I don’t know anyone working in the field of web-related topics who has never heard the name Chris Anderson. Anderson has spent years at the top-spot over at Wired, one of the most renowned magazines of the last two decades. He is the author of the New York Times bestseller "The Long Tail", too. That book describes a new economy of mass-customization and niche-products. 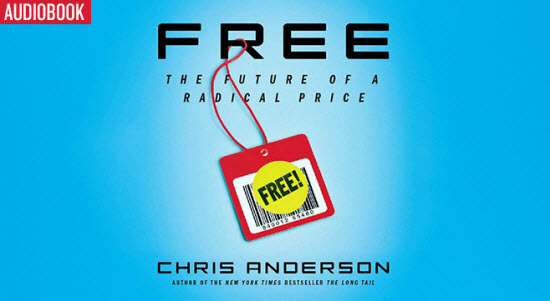 In "Free: The Future of a Radical Price" he analyzes how companies can make money offering their products for free. And it is this book itself, that now comes for this exact radical price: It’s a free download as an audiobook over at NoiseTrade. NoiseTrade is a platform that offers audio products for free while allowing the listeners to donate amounts they see fit. The donation part is not the service’s core, though. What NoiseTrade promises to deliver is a tool to build stronger listener relationships on a direct route from artist to fan. The artist offers e.g. an album as a free download, the listener offers his email address, country and postal code as a return payment. That way artists are enabled to build potentially large email lists, probably useful in future marketing operations. In its simplest form, they might plan their next concert schedule along those postal codes with the highest representation in the email list. The thought is not just theoretically successful, but stems from solid experience: In 2006 singer/songwriter Derek Webb gave away one of his albums for free online, asking in return for a little information (name, email address, and postal code), and as part of the process for fans to invite their friends to download as well. In three month’s time Webb gave away over 80,000 full downloads of his album and collected valuable information for as many new fans. In addition, Derek has since seen many sold out shows and increased merchandise and album sales, including a curious spike in sales of the very album that was given for free. It was the massive success of this experiment that inspired Webb, with the help of a few trusted friends, to start NoiseTrade. Today, even major record labels use NoiseTrade as a highly effective way to promote their artists by teasing new albums, giving away older or even brand-new songs for free or offering exclusive material not available in stores. I haven’t made it through the whole audiobook, I admit it. But the first five chapters have provided insights I didn’t have before. Ideas, while seemingly simple, I wouldn’t have had without it. Up to now I can say, "Free" has already helped me move forward. The only thing I could complain about, is the speaker. Okay, it’s Chris Anderson himself, and as such he has all the right in the world to read his own book. But, he is simply not as professional a reader as he is a writer. This makes listening quite tedious, but hey, the content deserves that you bear with Anderson’s monotonous reading style. From a content point of view, Free, I already said it, is amazing and does not stand one step behind the genius of "The Long Tail". Anderson starts out with the success story of Monty Python. They started to offer their whole portfolio in premium quality to be watched freely on YouTube as a reaction to pirated short clips in low quality. After two months, Monty Python DVDs ranked higher in Amazon’s sales charts than ever before. Anderson takes this and lots of other examples and analyzes the reasons behind their successes. If you want to take the chance to secure yourself some wisdom on building business on the concepts of free, which I strongly advise you to, head over to NoiseTrade or use the following widget, which even lets you listen to "Free" for free directly from here. If you decide to download the 300 mb heavy audiobook, click "Free Download", enter email, country and postal code and wait for the download link to arrive in your inbox. Check your mail, click the download link and enjoy.